Here, unfortunately, it happened to you too, a click too and you deleted those photos you absolutely wanted to keep! I guess you are now thinking about how to retrieve them, since you have no way of procuring them otherwise and you did not have time to send a copy to your friends. And if I told you that not all is lost, and is there a possibility that you can use programs to recover deleted images by mistake? Well, that is absolutely possible because in many cases the deletion of a file is apparent : in reality, the operating system is “instructed” to mark the space of the file as a free space, but the photo still remains, at least until it is actually overwritten; among other things, thanks to the integration of many cloud-based operating systems, you may have even stored photos on the Internet without knowing it! Whatever your case may be, you’ve come to the right guide at the right time: in the rows below, I’ll list you a list of deleted photo recovery programs that can help you get hold of what you’ve deleted by mistake. However, I must tell you immediately that the result is not always guaranteed: it all depends on how much you used the device after elimination, and above all, the type of device from which you need to retrieve the images. Try not to harm: cut out five minutes of time, sit comfortably and carefully read my directions and instructions to proceed, always remembering that not everything is lost! The first program I want to introduce to you is called Zero Assumption Recovery (ZAR) , is designed for the Windows operating system , it is completely free and it is born to recover both deleted photos and files by mistake and files on partially corrupted storage media. Before explaining how it works, I want to advise you not to save the recovered images on the same device from which you recover: you could do more damage and make it permanently unrecoverable. With this premise, the first thing to do is connect to the ZAR download page and click on the zarXsetup.exe link to download the program installation file. When download is complete, double-click on the file you just downloaded, then click five times on the Next button and finally on the Install button . If required, click the Download button and install this feature and wait for Windows to download and install the .Net Framework (a free component released by the same Microsoft without which the software may not work). Next, place the check next to Launch ZAR and click Finish to finish the setup. When installation is complete, start ZAR, click the Image Recovery button (Free) and choose the drive from which to retrieve the deleted photos by mistake. Click on the Next button , wait for the scan to complete (it may take several tens of minutes) and put the check mark on the RAW folder to select all the images or next to each extension to select them individually (you can see thumbnails of the images by spinning the Preview Image Files box . If you want, thanks to the entries in the program, you can only retrieve the photos taken in a given time interval (ticking the Date After and Date Before and filling them with the dates in question), or bigger or smaller photos of a given size (ticking and filling the Min and Max size boxes ). Once you have set the program as you prefer, click Next , then the button with the three dots ( … ) to choose the destination folder where you want to save the images (remember, as I explained before, to choose a folder that is not on the same unit). Finally, click Start Copying , wait for the operation to complete, and then click Exit . If all goes well, the recovered images will wait for you in the folder you choose! PhotoRec is one of the best free programs for recovering photos or other types of deleted files; is available for all major desktop platforms, but it works differently depending on the operating system used. For example, on Windows , PhotoRec has a great graphical interface; on MacOS and Linux , instead, the application must be used via terminal or command line . You can download PhotoRec from its official website by clicking on the link to your operating system (under TestDisk & PhotoRec 7.0 ). Along with PhotoRec, TestDisk, a free software for recovering data and recovering lost partitions, is also automatically downloaded, but you do not need it at this time. So let’s not lose any further talk and see how PhotoRec works on the various operating systems. As I mentioned just before, PhotoRec comes with a practical graphical interface that makes it easy to use (and much!) The use of the Windows operating system: from there you can proceed to photo recovery in a few clicks, without complicating your life with keyboard and command line! After downloading the archive containing the program, extract it to a folder of your choice, right-click the qphotorec_win.exe file , select the Run as administrator from the menu that opens and click Yes to start the graphical interface of PhotoRec. In the window that opens, click the File Formats button at the bottom, place the tick next to the boxes with the image extensions you want to retrieve (eg bmp, jpg, jpeg, png, gif, raw, and so on ) and click OK . Now, click on the Browsebutton and choose the folder where you want to save the recovered images – remembering, as I have recommended before, to choose a disk other than the one from which you are retrieving the files – click on the drive that contains the files to retrieve (top), put the check box on the File System in the File System type area (if you do not know what to choose, leave the check onFAT / NTFS / HFS + ) and choose whether to search only on the free space of the unit (by ticking the Free box ) or even the space used (by ticking the Whole box ). Set the program according to your preferences, click Search to start the search. After completing the procedure, click on the Quit button and, if all goes right, you will find the recovered images in the folder you selected earlier. As explained earlier, the procedure on macOS and Linux is quite different from that for Windows: in either case, you have to use the terminal to retrieve the deleted photos: follow the instructions I am going to give you, and you will see that there is no will be problems. If you are on macOS , extract the downloaded archive, open the program folder, then right-click the photorec file , select Open from the menu that opens, and then click the Open button ; if you are on Linux , extract the archive, right click on the photorec file, and select the Run item in the Terminal . At this point, the procedure to follow is the same on both operating systems: press the right arrow on the keyboard until the Sudo item is highlighted, press Enter and type the administrator password of your account; using the arrow keys and the Enter key, choose the drive from which you want to retrieve the photos. Now, before choosing the partition, use the arrows to select the File Opt(bottom) item, then press Enter. Press the S key to deselect all extensions, select the image extensions boxes ( jpg, png, gifetc. ), and add a check mark to each of them using the spacebar. After completing this task, press Enter, select the partition from which to retrieve, move to the Search item, and then press Enter again. Choose the file system of the drive you want to retrieve, click Enter, and then decide whether to scan the free space (Free) or the whole available space (Whole), since in the latter case the operation will be particularly long. To start recovering the deleted photos, select the destination folder where you want to save the recovered files (taking good care of what I told you before, that is, do not save the files in the same drive from which you recover them): keep in mind that to get up At the top folder you have to press on ” .. ” . Choosing the folder, press the C key on the keyboard to start the procedure; wait for the process to complete, please send it , then move it to the Quit entry and continue to send it to Enter. If everything goes as expected, the recovered photos will be saved in the folder you chose. Renee Undeleter is another useful tool for recovering deleted photos on Windows and MacOS . Except for the installation procedure, the operation of this software is identical on both operating systems, and this time is the usual recommendation: the files to be recovered must not be saved on the same drive / partition from which they are recovered, the operation may fail. To recover deleted photos with Renee Undeleter, download the version of your operating system from the official page: the free version allows you to retrieve up to 20 MB of files per operation, often more than enough if you are talking about deleted photos by mistake. If you are on Windows, double-click the file you just downloaded and proceed as usual; but if you’re on MacOS, click on the downloaded file, then the button Agree, finally, drag the file into the folder Applications on your Mac. If the programs I have shown so far have not satisfied you, you can take a look at Lazesoft Mac Data Recovery : this is a macOS application that, thanks to its very simple and intuitive interface, allows you to recover deleted photos in very few clicks and no particular computer skills. The first thing to do is connect to the program download page and press the Free Download Now button, then drag the downloaded file into the Applications folder on your Mac and start it by right-clicking on them and selecting the Open item from the menu that appears (only necessary at first start). To start the recovery of the photos, click the Deep Scan button , then the drive from which to retrieve the files, and again on the Continue button ; Now put the check mark in the Partition Recovery box by using selected file types , click the Continue button and place the tick in the box beside the Graphics entry (you can also choose the individual extensions to retrieve by clicking the small arrow next to it). Now push the Start Search button , wait for the completion of the analysis (it may take some time), then click on the check box next to each photo you want to retrieve and, when finished, click on the Save Files button. Select the folder where you want to save the recovered files (always remembering to use a disk other than the drive from which you recovered them) and wait for the process to complete. Wait, are you saying that you just do not want to install programs because you are afraid of damaging your Mac’s disk , or have you deleted for photo errors from your iPhone or iPad ? So I’ve got great news for you: if you’ve been deleted in the past 30 days , you have the ability to retrieve it both on the MacOSoperating system and on iOS (so on Mac, iPhone and iPad) using the Recentlydeleted album . Do not you know what it is? I’ll explain it right away: this album, introduced for some years now (I’m talking about iOS 8), is a sort of trash that contains deleted photos and keeps them for thirty days. You can easily recover such photos in one click or tap! To do it on iPhone or iPad , open the app photos of your device, then you tap on albums that you find at the bottom right. Go down to find the recently deleted album and tap on its icon: click on the photo you want to retrieve, then tap on the Recupera item at the bottom right, and again on the Recover button : this will reset the image only in the photo gallery, but also on iCloud . To access the recently deleted album on your Mac you have to follow the same procedure: open the Finder , then go to the Go Menu and the Applications ; click on the Photo icon , then on the File menu, and then on the Recently deleted show item . At this point, select one or more photos to retrieve and, to do so, simply click the Retrieve button at the top. How do you say? Did not find what you were looking for in your photo’s basket of your iPhone? Do not worry, I’ve talked to you in detail about other efficient ways to recover photos from iPhone in my specific guide on the subject . Do you have an Android smartphone and do you already know that in order to try to recover, do you need complex procedures? Before hacking into root and third-party apps, my advice is to try and recover deleted photos with Google Photos. I’m sure you’ve enabled auto-backup of your photos on Google’s cloud. In that case, you’re lucky because Google Photos is equipped with a trash can to recover the photos you’ve deleted in the past sixty days ! Additionally, this procedure is valid even if you have activated backup via Google Photos on your iPhone or iPad . To access the trash can of Google Photos, both on Android and iOS, click on the app icon to open it and then on the Menu ic icon on the top left; Tap on the Recycle Bin , press and hold your finger on a photo to select it , and optionally select other photos to retrieve; at this point, to reset the images, press the circular arrow ↺ on the top right. Do you have an Android device but the pictures you are looking for are not on Google Photos? Well, at this point you need to rely on a third-party app that can do this job: for the sake of precision, you can rely on DiskDigger, an extremely intuitive app that lets you recover deleted photos from Android in a few taps. Before I explain how to do it, I need to give you two quick information: the first is that DiskDigger is a free app for JPG and PNG photo retrieval, while it needs to be purchased in Pro (at a price of 3.37 Euro ) to recover other types of photos; The second, however, is that if the app is used on a non-rooted device, it is “limited” to perform a search and retrieval attempt in the local cache and previews ; To perform a full device memory scan, you have to grant the app root permissions – which you can get on your Android device following my tutorial . After installing the app from the Play Store, click on its icon to open it and, when prompted, click Yes to grant it root permissions , or click START BASIC PHOTO SCAN to perform the rootless scan. Choose the unit to do the analysis by clicking on its icon, then touch the box beside the extensions you want to retrieve (JPG or PNG if you are using the free version, or others for the Pro version). Now touch OK, wait for the completion of the analysis (it may take several minutes) and tick the checkbox next to each photo you want to retrieve, then click on the Recover button up. Now you have three choices: the first is to save the photos you’ve recovered through an app already on your smartphone, chosen from Dropbox, Google Drive , Email Share , WhatsApp, or other (in short, using the System Sharing menu) ; the second is to save the files to the device memory in a custom folder, and the third choice is to upload the recovered images to an FTP server . Tap the voice more congenial to your needs and follow the on-screen instructions to complete the rescue. How do you say? Do not want to enable root permissions on your Android or how far I’ve said so far can not please you? 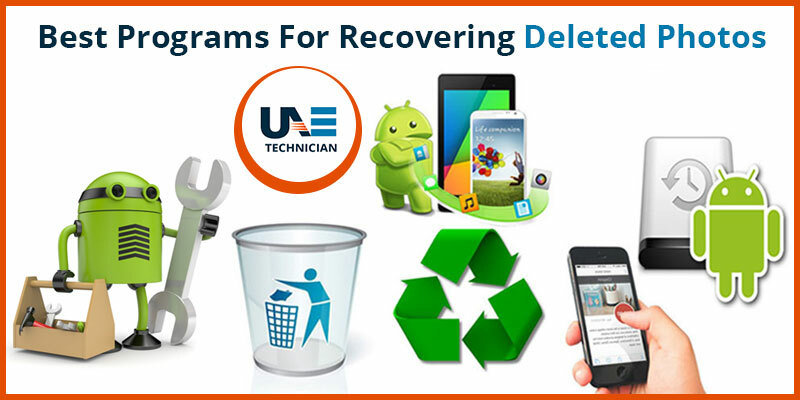 I recommend you take a look at my specific guide on how to recover deleted photos on Android for a specific insight into the subject. Now that you’ve read all my tips and tips, you should finally be able to retrieve the photos you’ve deleted by mistake from your devices, aware that next time you have to pay more attention before you press the “Delete” button of your operating system! I want to give you a last tip: if none of the previous methods satisfies you, or worse you still have to retrieve not erased photos by mistake but photos from a disk or memory that is about to break (or already broken), take a look to my guide specifies how to recover data from a damaged hard drive .